Hello and welcome. You may know me as Fluffy the Wise, frequent visitor to the taverns of many a castle. When i'm not wreaking havoc with my squad of horrible golems or gathering information to write tomes of advice, I have another profes- okay yeah it's a fanart thread, with fan monsters also. Not sure what I was going for with that grandiose introduction. Or maybe I deliberately subverted it on purpose for the sake of humor. Truly, some mysteries will never be solved. 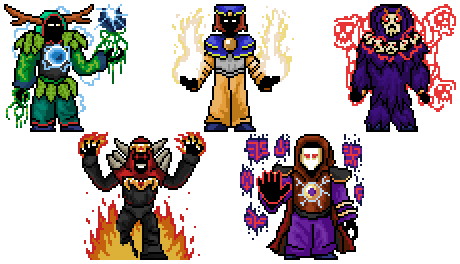 Some of you may have seen some of my fan spritework before, but for the folks who haven't I decided to create a place to consolidate it all in one place AND give me a medium to also write fan-lore about them (i love me some lore), hence this topic. 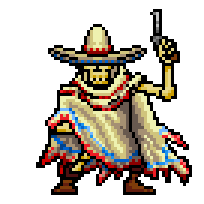 Sometimes when a wanderer possessed of a heroic spirit dies in the hot and unforgiving climate of the Barrens, Yseros takes pity upon them and allows them a second chance as a wandering skeleton. Unlike most of Rodia's skeletal dead, these creatures seek to mete out justice and defend the downtrodden wherever they may be. Tales abound of outlaws and bandits who terrorized villages being ousted and humiliated by a lone, wandering gunslinger with an unerring aim, who wandered off into the sunset never to return once their heroic deeds were done. 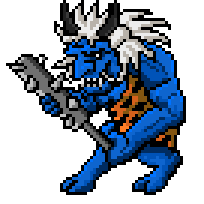 Oni hail from the same distant land as the Shoguns, and though Rodia has yet to witness them in the flesh, they are already dreaded from the tales told by those wandering brownies who had encountered them and lived to tell the tale. Clad in furs and hefting a crude spiked club, the Oni possesses strength enough to smash and destroy whatever it so desires, which quite often turns out to be everything it can find. Though brutish, they are still possessed of a cruel cunning that makes them surprisingly difficult to outwit.